Upon sign-up, each new member chooses criteria for their ideal partner. The Combinar staff then go through the site with a fine-toothed comb in search for someone who matches the initial criteria, just like a traditional matchmaker would do. Instead of allowing users to browse databases, Combinar presents potential partners. Combinar is a totally new model – it combines traditional “personal matchmaking” with the requirements of the business world. 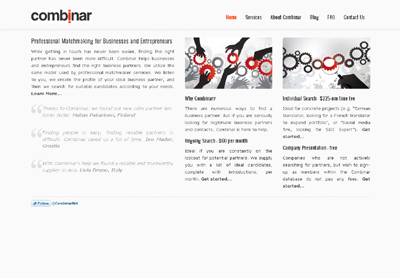 It allows entrepreneurs and businesses to quickly find partner while maintaining a high quality of those connections.